Award-winning, one-of-a-kind, and ready to use, your productivity will reach new heights as you sit in the Steelcase Leap Ergonomic Office Chair. Starting with the Leap's superior lumbar support, which will keep you tasking without all of the back strain that comes with sitting in front of a computer a majority of the day, thanks to built-in LiveBack technology. Fine-tune the chair's LiveBack technology, which allows the chair's back to flex with your movements, providing superior support to the places that need it most. The office chair's padded back and seat cushion are soft and supportive; customize yours to your liking with a collection fabric options for an ergo-friendly seating solution to keep you working comfortably. Designed to deliver to each individual that perfect level of spinal attention, the Leap Chair is also well-loved for providing full back support, and allows you to recline effortlessly via its Natural Glide System. A back-saving design promotes healthy postures while also supporting disc walls, combating back pain, fatigue, and major spinal issues in the process. 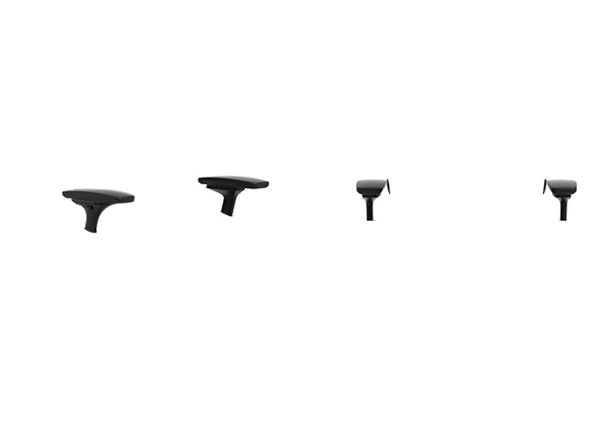 Last but not least, the Leap features a sleek profile with complete ergonomic adjustability for users ready to take their work to the next level. In your search for the ideal ergonomic gear to add to your office, you might come across Steelcase products that seem cheaper than they should be. Most of these chairs and accessories are refurbished, giving you a not-so-new seating solution that can be open to mechanical flaws and defects sooner than a new ergonomic chair might be. The Leap and Amia share many great traits, like Steelcase's fabulous adjustable arms. The Leap offers a little more flexibility in the backrest, and some find it to have a more natural "arc." 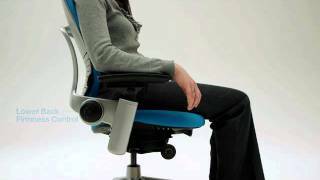 The adjustable backrest could make it worth the extra money to upgrade to the Leap. However, many customers (and our employees) actually prefer the Amia. How does LiveBack differ from standard lumbar support? LiveBack just refers to the back of the chair and not the lumbar itself. 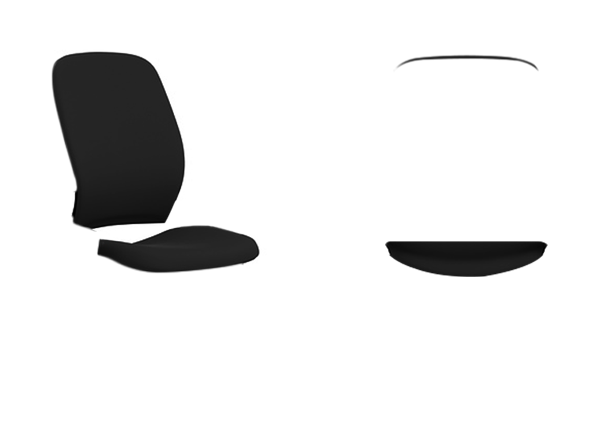 The back of the Leap Ergonomic Chair features slats that dynamically support your spine. An adjustable lumbar lever allows you to move the lumbar support up or down to provide support where it is needed. Can I add the headrest after buying the chair? No, the headrest cannot be added to the Steelcase Leap Chair after the fact. Can I get a discount on the Leap if I buy it with an UPLIFT Desk? Give our knowledgeable Sales Pros a quick ring and they'll be able to tell you about the most current Steelcase deals and discounts. How closely do the fabric colors shown on your website match the actual fabric colors on the chair? Computer display settings can affect how you view colors on your monitor, and there is no guarantee that your color settings are showing the precise shade of color on any fabric. You can submit a request for color swatches through our Sales Pros so that you can accurately assess the color before ordering. What if I change my mind after I receive my custom chair from Steelcase? Steelcase offers free returns for the first 30 days. They will even pay for return shipping! So if you get your chair and it is not what you wanted, by all means return it and try something else. The Steelcase Leap Chair is available with or without arms. There are some applications where arms get in the way of tasks. For computer users we recommend Steelcase arms because they're some of the best on the market and they can lower to about thigh level. The highly adjustable arms move in and out, forward and back, up and down and pivot, so you can find the exact position for optimal support and comfort. 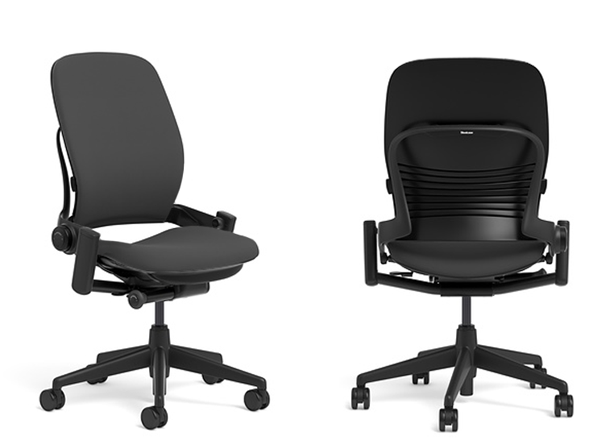 The Steelcase Leap Chair is available in two seat heights, standard or tall. The Steelcase Leap Chair is available with or without a headrest. The headrest provides additional support to the head and neck and provides an easy height adjustment. Super happy with this choice - I ordered it in camel and couldn't be happier with the color. The chair arrived when promised, came fully assembled and is as comfortable with my bad back as chairs I considered at twice the price. It's easy to adjust and has made all the difference in the world for sitting at the desk using the computer. with bated breath I waited for this chair ! it took a fews days longer than anticipated to arrive ! just got it out of the box and adjusted it just the way i want ! the arm rests do have some cushy to them, just right ! i got the basic cloth and i am completely pleased with it ! i have the lower back revved up to the most support setting and the upper back setting as loose as it goes ! the arms i have pulled in and up as far as it goes ! my feet lightly touch the floor ! the arms are adjusted to the height of my dinner tray believe it or not on which i have a very small apple iMac keyboard ! i just lowered the arms to the bottom and put the keyboard on my legs ! all perfect ! I find i do like to lean back ! I have significant scoliosis and I am a born writer ! i should have gotten this chair years ago ! ahhh well I finally came to my senses and got excited about getting a chair ! i mean really . . . . somehow it was not the first thing on my mind to spend so much money on ! i still plan on setting a timer for 30 to 60 minute intervals and jumping up and doing moving things all day alternated with sitting down ! I don't plan on sitting for hours on end without getting up even on this chair ! But hurray ! shazaam ! when I do sit i do feel so much happier ! Thank you Human Solutions ! I have an ongoing lower back pain from pulling my back muscle too many times. This is a great chair to soften the pressure on my lower back and to maintain circulation in the lower legs. I'm thrilled! Well worth the investment. It came fully built with a beautiful red fabric of my choosing. I was reluctant to spend $715 on a chair, but my previous, inexpensive desk chair was causing me tremendous pain and sleepless nights. Months of damage had occurred before I realized my chair was the culprit. As soon as I replaced it with my Leap chair, I began to heal. I'm almost fully recovered. I love all of the adjustments the chair has, and I've found that by moving and adjusting every hour or so, I can be comfortable in the chair the whole work day. I bought the Leap chair in leather with headrest. The ergonomics on this adjustable chair are excellent except for one thing. I have a bad hip and the seat padding is just too thin for my hip to be comfortable. I really like the chair other than the excruciating hip pain from the thin seat. Does anyone know of a thicker seat replacement available in the aftermarket? I was looking for a chair that would be comfortable to sit in for up to 12 hours at a time and I found it in the Steelcase Leap Ergonomic Office chair. This chair is comfortable, came already assembled and totally adjustable. I purchased the foot stool too and together they make a great combo. The only thing I might have done differently is to have ordered the chair with a head rest. I would recommend this Ergonomic Office Chair to anyone who's looking for comfort while working. This chair is amazing! It's the best chair that I've ever had. I have two herniated discs in my neck which have made sitting at the computer for an extended period of time very painful....until now. Because the chair is totally adjustable, I am now sitting and working in an optimized position. I recommend the Leap chair to everyone who "sits" for a living. I have had this chair for about a month now. Ordered it with the cloth material, with arm rests and a head rest. I work from home on my computer and my back is very happy I purchased this chair! The adjust ability is fantastic, the seat padding has just the right amount of cushion, and the adjustable amount of recline is awesome. It's a pricey investment, but if you work from your computer 8-12 hours a day it's definitely worth it! When I received my Leap chair, the base was broken on arrival. One of the wheels had broken off the base. The problem is in the packaging. The base does not have any cushioning to protect it in transit. Others have given 5-star reviews, perhaps because their bases weren't broken. $978.00 List Price: $1,553.00* The list price is the same as the MSRP (Manufacturer's Suggested Retail Price). It may not necessarily be the price at which the product is sold.